David Jungblut, of Ocean City, discussed ideas for natural disaster preparedness recently with his classical science students at Oakcrest High School in Mays Landing. Brandon Daube, 17, of Mays Landing, explained a oil rig emergency shutoff valve of his own design with the students in Jungblut’s class. 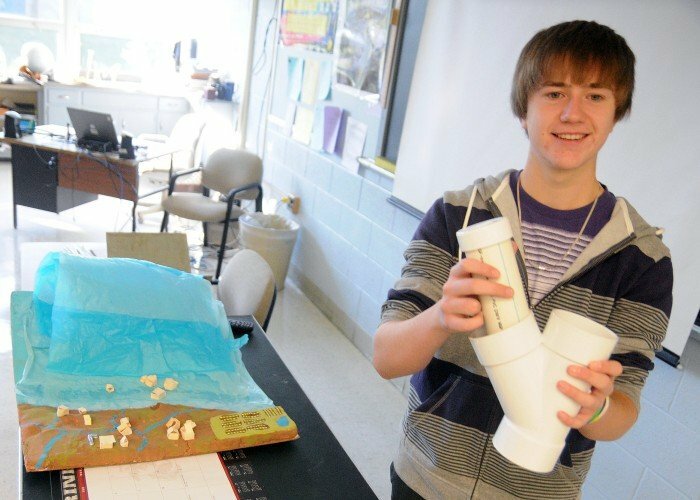 Michael Cline, 19, of Mays Landing, a former Oakcrest student now studying at Atlantic Cape Community College, discussed a levee system of his own design recently while visiting with the students in David Jungblut’s classical science class at Oakcrest High School in Mays Landing. Oakcrest High School classical science teacher David Jungblut, of Ocean City, will present some of his research at the American Geophysics Union conference, scheduled for early December in San Francisco. Jungblut and Cline explained the levee system that Cline and his group designed in Jungblut’s class when Kline was a freshman at Oakcrest. Dave Jungblut and his students at Oakcrest High School are working hard to minimize future natural disasters. Jungblut, of Ocean City, was selected out of 20,000 applicants, to present his scientific findings and educational program at the American Geophysics Union conference next month in San Francisco. In Jungblut's classes, the approach is hands-on. Students might drop the books for a week while they remedy the Deepwater Horizon oil spill or build hurricane-proof levees. Brandon Daube, a junior from Mays Landing, took Jungblut's class, classical science, as a freshman. He created a backup system that he believed would have prevented the Gulf oil spill. "It was maybe a few days after the leak actually initially occurred," Daube said. "I remember sitting in class, and (Jungblut) was talking about it. I asked about how we could have prevented it. Next thing you know, we started talking about it more and more. Next thing you know, the whole period was dedicated to it, and every other period was dedicated to that." Michael Cline, of Mays Landing, is now a sophomore, a computer science and marine biology major, at Atlantic Cape Community College. As a freshman at Oakcrest, Cline took Jungblut's class and worked to prevent the bursting of future levees. He and his group designed a levee with flexible sheet metal walls. "It would keep the water in, and some would flow over," he said. "It wouldn't break the system, causing mass flooding throughout." For Jungblut, Hurricane Katrina was an intimate disaster. His daughter move to New Orleans two weeks before the storm hit. His brother and nephew lived in Mississippi. He went down to help his daughter clean up, and he fell back into some of his past scientific experiences. "When I graduated from Rutgers, I worked for (the U.S. Geological Survey) for three years," he said. "My job was to go to floods and measure how much water was going down during the flood. So delineating between the flood zone and non-flood zone was something I was taught. Then when I went down to Katrina, people were saying, well it's all flood damage, we're lost." Thanks to Jungblut, they weren't lost. He was able to prove that much of the damage was in fact due to wind. This allowed them to file insurance claims. 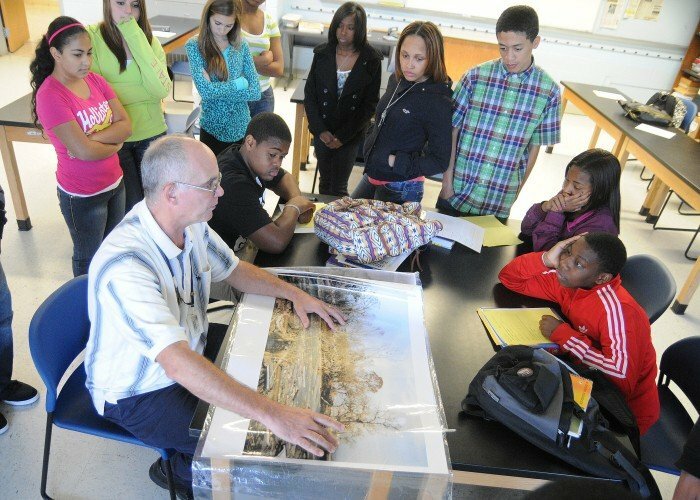 Back in his classroom, he asked his currents students to observe some photographs of the Katrina damage. They were to report their findings. "It looks like it might have had some wind damage," said freshman Paul Bartlett, of Mays Landing. "Why do you say that?" Jungblut asked. "The aluminum steel is kind of hanging a little bit," Bartlett said. "It's looks ruined." "The water level did not get over that high-rise apartment, so you're right, that would be out the flood zone." "So their insurance would cover that?" Bartlett asked? "They will be able to claim insurance damage," Jungblut said. Jungblut is working on a book about his experiences - personal, scientific and educational. He made several high level scientific discoveries during his time in the Gulf, but he's capable of shifting seamlessly back into high school science language. "I also did studies in New Orleans, which a number of lawyers looked at because nobody explained what had happened," he said. "Microburst activity isn't considered something that hurricanes actually develop. Katrina was unusual because damage area was usually in ..."
"Mr. Jungblut," said Jillian Higbee, a freshman from Mays Landing. "Why is it white in the background? It looks like snow, but it's obviously not." "That's like tissue paper hanging all over the place," he explained. "There was also stuff to spray down to prevent diseases." Cline said that Jungblut used this pragmatic approach to simplify complicated concepts. "He's really good with hands-on teaching," he said. "He goes into great detail with everything he does. When he starts talking about Hurricane Katrina, that could be a weeklong, two-weeks-long project. And you're learning almost everything possible about it. His class was a really good class, and I learned a lot from him."